What do you get when you combine music, art, food and a 180 degree photo booth? If you guessed Skookum Festival in Vancouver, you’re right on the money! As you know, our team enjoys traveling wherever the festival scene takes us. Last month, Virgin Mobile kindly brought us on board for the festivities at Stanley Park. Of course, we were pretty amped to bring the party-err, miniFreeze- to the festival! Stanley Park was the perfect backdrop for our activation. I mean, it sits right on the Pacific Ocean, surrounded by mountains and a forest of massive trees that are nearly thousands of years old. To say Stanley Park is one of the most unreal parks in the world would definitely be an understatement. Over the course of the weekend, Vancouver’s most talented chefs showcased their delectable dishes as a variety of musical acts took the stage to pump up the crowd with the jams. Some of the acts featured crowd favorites such as The Killers, Florence and the Machine, Metric and St. Vincent. Pretty solid lineup to say the least! 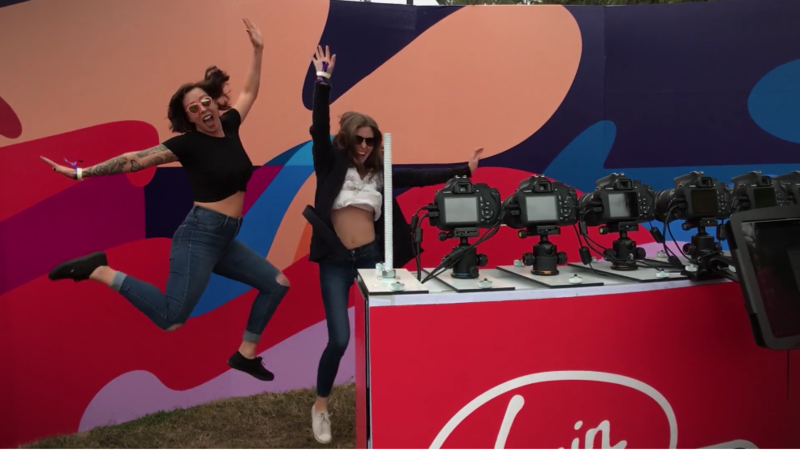 Our team thoroughly enjoyed bringing the “Pixperience” to the first ever Skookum Festival, thanks to Virgin Mobile. Partnering up with the festival’s sponsor was awesome! This was the perfect way to close out the summer, and we hope to be back next year. Until then, we’ll continue to bring our interactive photo experiences where they’re wanted this season! Till next time, friends!